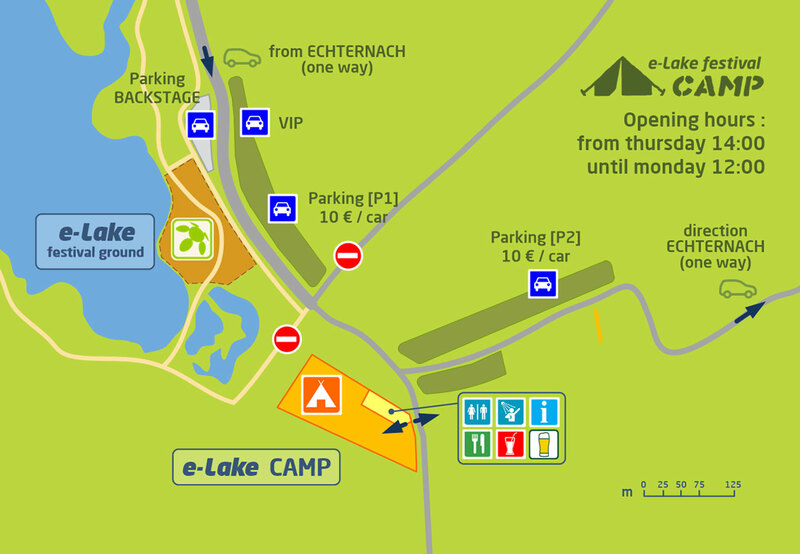 The campsite is situated close to the festival site (+/- 10 minutes walk) and opens on Thursday at 2pm. Arriving earlier is not recommended as you will find yourself in front of closed doors. The site will close at 12 pm on Monday. Camping is only permitted in the designated area. Wild campers will be cautioned and fined by the wardens / security guards and will be forced to leave immediately. 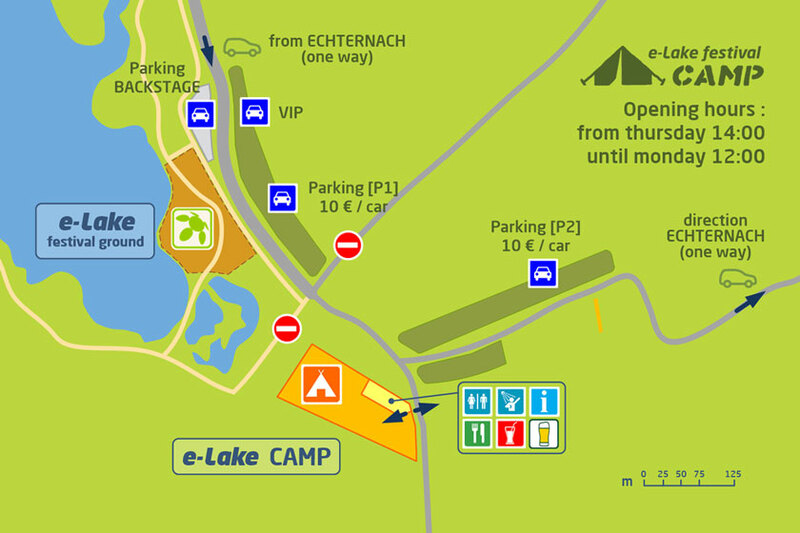 Every user of the camping will have to pay a one-time fee of 35€ per person (inclusive of the 10€ waste deposit) at the entrance to the campsite and will receive a camping-wristband as well as a binbag with a binbag token. If this binbag is filled and returned together with the binbag token at the respective return station prior to the departure, the waste deposit will be returned. The CAMP-STORE offers you fresh bakery products, sandwiches and coffee as well as cold softdrinks an beer. The CAMP-STORE is almost open around the clock. One can leave or renter the campsite with a valid camping-wristband around-the-clock. At the entrance checks your luggage may be checked for prohibited items. Be aware, that these checks are also conducted for your own safety. No unaccompanied under 16’s on the CAMP. Anyone under 16 must be accompanied by at least one parent. Please present appropriate identity documents on request. No private vehicles are permitted on the campsite at any time. The camp-users’ cars may be parked on the adjacent parking – this parking is reserved for camping users. Due to technical reasons it is not possible to park caravans, minibuses or similar vehicles on the campsite. We reserve a separated area for minibuses & caravans. The respective spot will be allocated to you by the e-Lake wardens. Please be aware that no water or electricity supplies are available. Our location is split into different areas. Please respect the instructions and regulations. Please make sure to keep the escape routes free. Tents that are in the way will be removed immediately. The entire camping-area is fenced. The climbing over barriers (construction fences, deer fencing etc.) is strictly prohibited. In case of infringement, the waiver of access (i.e. the camping-wristband) will be confiscated. Please do not destroy any natural barriers such as trees or hedges on the campsite. The organizer is not liable for damages or losses that occur to the festival guest through theft, burglary, fire or acts of God. Disproportional superstructures such as party tents are not permitted. Petrol-driven power-units are not permitted because of fire hazard and noise pollution. Open fires are strictly prohibited on the entire site! Exceptions are camping stoves and charcoal barbeques. The use of liquid charcoal lighters is not allowed. Please make sure that there is enough distance kept to adjacent tents. Please do not attempt to cook something inside your tent – that is very dangerous! Not permitted are furnishings such as sofas, armchairs, building material, bulky waste, and fridges. Not permitted are spades and any kind of weapons. Not permitted are loud music and megaphones. The selling of goods (food and non-food items) is prohibited. The distribution of any kind of promotion material is not permitted (we would like to avoid waste). With exception to guide-dogs, animals are not permitted. Adequate checks will be carried out. We appeal to you to respect every single one of these rules. Please make sure to dispose of your waste entirely so that we can return the site unharmed back to nature. The site consists of land belonging to local farmers who are friendly enough to allow us to dispose of it for the time of the festival. All damages must be paid for. Hence no bottle lids, broken pieces of glass, cigarette buds or other things must be left behind on the campsite. Please collect even your neighbours’ rubbish to fill up your binbags. Climate and environment protection are big themes for open airs. e-Lake festival would like to show together with its guests that a weekend of fun, music and environment protection are not exclusive of each other. The enormous rubbish production has become a problem for our festival over the course of the last few years. In order to be able to use the agricultural land for camping in the future, a great improvement is necessary. We need your support to make festival camping secure and you can actively participate in being environmentally friendly. Over the course of the festival cleaners will regularly and continuously keep the festival site, areaways and larger alleys on the campsite clean and empty rubbish bins. If someone seriously annoys someone else and / or disregards the rules, he or she will be suspended from the campsite! These rules and regulations are subject to change in specialcircumstances.